Ministry of Walls Street Art Shop Gallery is stocked with colorful artists, each one with its own meaningful purpose. We listen to the market and acquire the most coveted artworks for our collection. Banksy is a pseudonymos English gravity artist, political activist, film director, and painter. Banksy, Britain’s now-legendary „guerilla“ street artist, has painted the walls, streets, and bridges of towns and cities throughout the world. Not only did he smuggle his pieces into four of New York City’s major art museums, he’s also „hung“ his work at London’s Tate Gallery and adorned Israel’s West Bank barrier with satirical images. Banksy’s identity remains unknown, but his work is unmistakable—with prints selling for as much as $45,000. Otto Schade was born in Chile on the 30th October 1971. He has always felt an avid fascination for the Surrealists. This influence has made Otto turn his creative skills to painting, which has become his strongest passion and for which he has also been recognized with an honorable mention.With the development of this other talent, Otto begins a journey in the search for new ideas and wider exposure for his work, taking him to exhibit his work in Concepcion (Chile),Berlin (Germany), Moscow (Russia) , New York (US), Amsterdam (Netherland) and finally to London (UK), where he is currently living and working. Otto’s painting ranges from abstract and surrealism to even urban art. Working mainly with oil paint and traditional supports such as stretched canvas, he also practices other techniques such as collage, illustration and stencil. Blek le Rat was born Xavier Prou in Paris, France in 1951. The pioneer of graffiti writers in Europe, he was one of the first to use stencils for creating icons instead of writing his name. He was first exposed to graffiti in 1971, in New York, but didn’t start making his own until ten years later, in Paris. Inspired by a stenciled portrait of Mussolini he created a silhouette of a rat running along the streets, which quickly became recognized around Paris. Blek’s work has been exhibited in galleries around the world and featured in publications such as TIME Magazine, The New York Times and The Los Angeles Times. In 2008, his first monograph, Blek le Rat – Getting Through Walls, was published by Thames + Hudson. In 2011, Art Publishing, Ltd. released Blek le Rat: 30 Year Anniversary Retrospective. 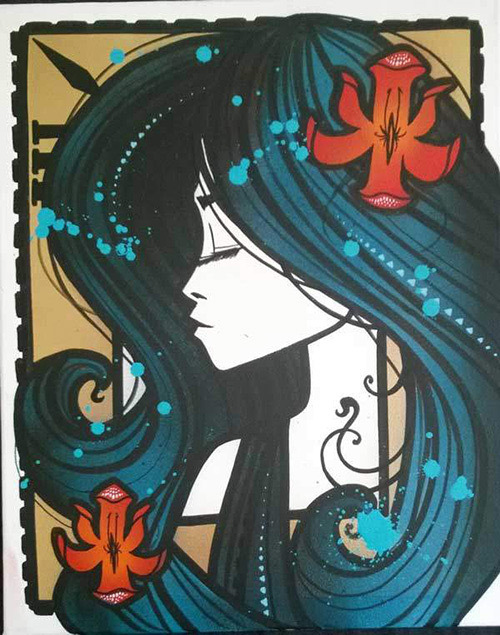 Inkie is a London based painter and street artist from Clifton, Bristol. He is cited as being part of Bristol’s graffiti heritage, along with Banksy, 3D and Nick Walker. His style draws on art nouveau influences with an urban twist. Living in the town of Bristol he was a member of Crime Inc. Crew alongside 3D of Massive Attack fame and Nick Walker ‘aka’ Apish Angel and painted his first wildstyle in the summer of 1984. He came 2nd in the World Street Art championships in 1989 against fierce competiton from LA, New York and all the major European countries. but later that year was arrested along with 72 other writers as the ‘Kingpin’ in the UK’s largest ever Graffiti bust Operation Anderson. In the late 1990’s he moved to London at the same time as fellow Bristolian & graffiti cohorts Banksy & Will Barras has since worked as a leading graphic designer in the video game industry as well as continuing to contribute to the UK graffiti scene. He is also responsible for Europe’s largest permanent urban art project, See No Evil. A far cry from 1989 and his days of being arrested for his graffiti, these days Bingle can claim to be the first and only street artist to paint inside the UK’s Houses of Parliament. His aim is to encourage the public not just to ’see‘, but to look at what surrounds them and their lives, reflecting our increasingly bizarre fascination with celebrity, fame, consumerism and materialism, rethinking, reworking and subverting imagery drawn from a refuge of decades of materialistic consumption, imagery appropriated from currency, advertising, comic books, these now iconic motifs, cultural figures and genres are subverted to comment upon our conspicuous society. His work can be seen across a variety of different media, applying his playful, tongue-in-cheek imagery with anti establishment values. His work regularly sells at Christies, Sothebys and Bonhams auction houses and yet he still continues to put his work illegally into the public domain, and as such has extensively traveled the world showing and disseminating his artwork. In 2005 D*Face set up the gallery ‚StolenSpace‘, which continues to be Londons foremost contemporary urban art gallery. Martin has a continuous urge to search for beauty in what is commonly dismissed as ugly, out of style or simply left behind. He looks for inspirations in people, city landscapes, old buildings, graffiti, posters and decaying walls. This interest for decay has helped develop his style, motives and composition and he enjoys creating either unity or conflict between materials, backgrounds, motives and human intervention. His artistic expression started more political, but has developed into a more subtle expression blending graffiti, stencil art and decay together. Inspired by artists like Jose Parlá and Cy Twombly. His abstract graffiti and stencils are a mix of urban scenes showing the development of a walls lifetime. He use grey tones as a basis but adds vibrant colours to break the monochrome concrete expression and bring a splash of life to his motives. 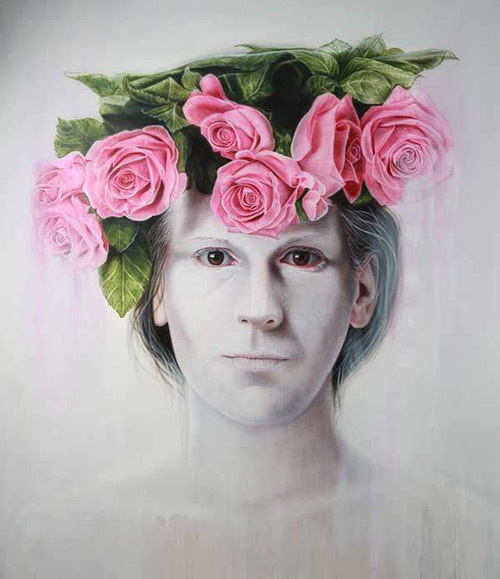 Since his artistic debut in 2004, he has had several solo shows and participated in many group exhibitions, both nationally and in international metropoles like Tokyo, Paris, London, New York and Los Angeles. Francis Bacon has also been an obvious reference, in particular his „Screaming Pope‘ painting based on a portrait by Velasquez, which I have appropriated, as well as looking at his other work when Cosmo was breaking down some of the dance moves. Through a subtle interplay of multiple realities overlapping in the chronotope, Battaglini evidences the contradictions in mental models about the temporal contrast (chronological), and the cultural and linguistic barriers. Compositions which at first seem ‚logicals‘, immediately reveal temporal and spatial limitations that are disruptive in the interpretation of reality. Battaglini invites us to think that in today’s global village, with the ‚democratization‘ of culture, the evolution of knowledge, information immediacy, immersed in the heterogeneity, the Patchwork Culture forces us to confront with a need understanding beyond our geographical boundaries of time. Probably the uniqueness of the Italian artist Marco Battaglini is to conceptualize the possible coexistence of the ideals of classical beauty with the anti-aesthetic, the combination of the divine and refined with the vulgar, through a composition that can complement different realities in an eternal instant. His research of multidimensionality leads him to overlap different temporal, spatial and cultural realities, where everything seems to make sense… This is ultimately the Battaglini’s purpose: remove barriers that distort the perception of reality. L.E.T. is a stencil artist born in France. The abbreviation L.E.T. is itemised as Les Enfants Terribles. His style is also traditional: his works quote the amusing, provocative and ironic english streetart. He gets his inspiration from other famous works, which he interprets in his own special way. He prefers a similar method during the process of creation: he focuses on the motiv, which has a strong symbolic meaning. He adopts various picture elements from different well-known works. By putting these pieces together in his oeuvre like in some kind of collage he gives them a new message or consistently develops the ideas of his colleagues. L.E.T.’s technique and figurative language also reminds us of the streetart-classics. These parallels in his articulation are an intentionally hommage: in this way he enters into a dialog with other streetartists. Black-and-white figures, which get new meaning through colourful accents, the smooth forms of his graphics and typographic works and creations with typical naturalistic appearance – these are the elements, which designate his art and make it attractive and exciting for the viewers. Moreover, L.E.T.’s art is filled up with social criticism and uncovers the disgraces of our society based on consumption and hunger for enjoyment. L.E.T.’s art career is marked by group-exhibitions and streetart conventions all over the world. His consistently (constant) development as an artist was his way into the galleries, where the ephemeral streetart can be preserved for the public. For this work, he prefers such media as canvas, cardboard and wood, which are suitable for a gallery. This has no influence on his unmistakeable style. David Uessem was born in 1981 and lives and works in Oberberg circle. He is a talented illustrator and has done courses in paintings and graphics. He mixes acrylic and oil techniques in his artwork, which makes his paintings so awesome as you will see in this post. He is also specialized in portrait and figurative painting and his artworks have been shown last year in several famous exhibitions and will be presented again this year. Wolfgang Krell – German street artist – painting mostly on canvas and walls, using a lot of different techniques. Krell works on large-scale surfaces with acrylic, spray cans, charcoal and brushes – Writer name is Cole TWS. He was born in Dortmund, Germany. Krell has his roots in graffiti art. He produced his first pieces in 1983. He has presented his works in many solo and group exhibitions. In his latest work, he experimented with a mixture of stencils and spray paint, acrylic and pencil. Weapons are a big theme in his paintings. His credo is to tell stories or just move things into the right light. The stories Krell tells are mostly positive. Fuggi (Daniele Fuggiano) is a german – italian artist. He became famous trough a work for Snoop Dog, who cared for worldwide attention and made him known. At Ministry of Walls Street Art Gallery, the artist present his Street Art Car Series exclusively. Well known Oltimer seen from above. Past people leave Hate or Like Tags on the vehicles. Fuggi is an artist, fashion designer and a fantastic draftsman. He lives and works in Cologne / Germany. The car series is exclusively available at Ministry of Walls Street Art Gallery. Four times a year there is a new work available here for sale. Just A Small Sample of The Artists In Our Streetart Collection. We Have Many More Including….your urban art broker.